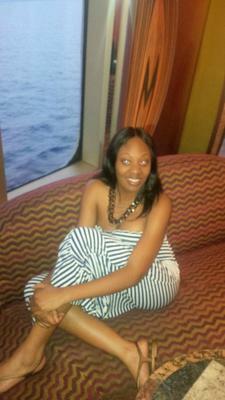 This was my first time sailing with Carnival Cruise Lines. I was accompanied by my best friend of 6 years, Lauren Giles on this Carnival Freedom cruise. We decided to go on the cruise to celebrate her 25th birthday. 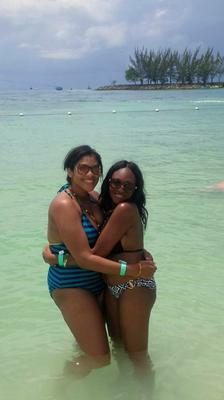 Additionally, we were both in desperate need of a vacation and thought a cruise would be the remedy to our problems. Prior to going on the cruise, I had always seen the commercials for Carnival and other cruise lines but never really paid any attention to them. Still, being the adventurous person that I am, I wanted to try something new and thought a cruise was the best thing to do - because it was affordable and I heard many raving reviews about cruises. Thus I thought I would try my luck. Early January we started searching for cruise lines and cruise packages and consulted with our Travel Advisor, Peter Grant. Peter has been on many cruises. Thus he was the right person to plan our trip with. 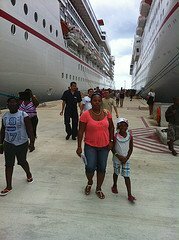 By the end of January we had booked our cruise for the summer, which was a 6-day cruise abroad Carnival Freedom. We decided collectively to go on Carnival Cruise Lines due to the fact that it was supposedly the "Fun Ship" and had a lot of younger people on it, compared to other cruise lines such as Royal Caribbean. I can definitely say having been on the cruise the latter is true. Fast forward to Mother’s Day, May 12th, 2013 the day of our departure for the cruise - From the moment we left the Fort Lauderdale International Airport, I was overcome with emotions ranging from nervousness to excitement. I did not know what to expect but was happy to get “away,” even if it was only for a week. However, my feelings quickly subsided once we boarded Carnival Freedom and went through the check-in process which was smooth). I would compare it to checking in to a hotel. After we checked in we went to our room. Much to my surprise, it was not as I expected. Though small in size it was still comfortable and nice. From there we showered and got dressed quickly so that we could go to dinner. Prior to the cruise we had the option of choosing our dining style. We chose “Fine Dining” which I would say was one of the best decision we made during the cruise process. The food was great and exceptionally prepared. The hostess, waiters, and rest of the dining room staff were very friendly, energetic, and well-mannered. Additionally, they gave us the “royal” treatment by pulling out the chair for us as we sat down to eat. Also, they made dinner pleasant and enjoyable with their many performances - one which included them dancing to the popular tune “Gangnam Style." After the first night I felt more comfortable being on the cruise and excited about the week’s activities. Day 1 - We ported in Key West, visited various shops and took in the environment. Day 2 was Fun Day at Sea. Although, we were on the ship for the whole day we still had fun. We did karaoke and met the Captain of the ship during the Captain’s Celebration, took pictures, and ate dinner which was delicioussssssssss! Day 3 we ported in Grand Cayman and went swimming with the Sting Rays. This was one of the best experiences of the cruise. Even though I was frightened at the idea of swimming with the sting rays, I must say that I enjoyed it. Day 4 we ported in Ochos Rios, Jamaica. This was by far my favorite port. From the moment we arrived in Jamaica I felt a sense of calm and relaxation. The locals were friendly and entertaining to say the least. They welcomed us with open arms and made sure our experience was enjoyable. While in Jamaica we went to Dunn's River Falls, the popular tourist site. Before going on the cruise Peter had vehemently suggested that we go there. I am glad that we took his suggestion, because I had a blast climbing the waterfall with water pouring down as we ascended to the top of the Falls. This was an unforgettable experience for me and I must say that I would do it all over again. I felt so refreshed and energized after I had climbed the Falls. After Dunn River Falls we went to Paradise Beach and lay on the beach, while listening to some Caribbean rhythms and eating Jamaican barbecue. Day 5 (our last day on the ship) was filled with going to the top of the deck, casino, the gym, and Salsa dancing - although, Lauren and I were both sad about leaving the cruise ship the next day. We still made sure to enjoy ourselves for the last time. We ended the day the same way we started our cruise in the hot tub. We reminisced about our experience and expressed our interest in going on another cruise. Day 6 (Departure Day) - We ate breakfast at a different dining place than we typically ate at. After breakfast we returned to our room and gathered up our belongings to get ready to disembark. The disembarkation process, just like the check-in process, went by fairly smoothly. We went through customs and did not have any issues. In conclusion, this being my first cruise ever, I must say that I really enjoyed myself and had a great time. There were no bad moments at all only good. I am glad that I chose Carnival, because Carnival Freedon was indeed a “Fun Ship." We met so many people from all over the U.S. and made new friends. I did things that I never thought I would do in my life such as eating frog legs and swimming with sting rays. I would say to anyone contemplating on going on a cruise - What are you waiting for? Expand your horizon and CRUISE!!!! I did and am going back for more. However, if I had to offer some advice it would be to sleep less, go on an excursion or two, choose shared “dining” as opposed to private “dining” and take PLENTY of PICTURES.